What Do You Think Are The Major Technology Trends Which Will Impact Library Services? On Tuesday 21 October 2014 I am giving a talk at the ILI 2014 conference which will address the question What are the major technology trends that will impact library services and their users? This talk takes place on the morning of Tuesday 21 October 2014, the opening day of the conference and is the first talk in Track B, the Technology Innovation and Impact strand, one of the three conference tracks. The talk will be based on the approaches taken by the NMC Horizon team in the development of the NMC Horizon Report > 2014 Library Edition, a 50-page report which “examines key trends, significant challenges, and emerging technologies for their potential impact on academic and research libraries worldwide“. I was pleased to have been invited to participate in the expert panel which took part in the NMC’s process for identifying the key emerging technologies and the significant trends which are driving their adoption and the challenges which may impede their take-up. The report describes 18 topics which the expert panel identified as very likely to impact technology planning and decision-making: six key trends, six significant challenges, and six important developments in technology. In my 30 minute talk I will review two technologies which the panel feel to be significant ion the short term (less than a year to adoption), two trends driving technology adoption in the medium term (3 to 5 years) and two difficult challenges which may impede technology adoption in academic and research libraries. Since the report is freely available online (in PDF format) I do not feel that simply summarising details form the report will be the most effective use of the session at ILI 2014. Instead I will describe the ‘Delphi; approaches used by the panel in identifying and then ranking the key trends, challenges and technological developments. I intend to then invite the audience to participate in a mini-Delphi process, whereby they can add their thoughts on technological developments of importance in the short term, trends driving technology adoption in the medium term and difficult challenges which may impede technology adoption in academic and research libraries which may have not been prioritised in the NMC Horizon report. I intend to gather the suggestions during the talk, using a combination of asking the audience for their suggestions and inviting suggestions on Twitter. This will be followed by a quick vote to identify the responses which the audience feel are most important. Attempting to reduce the Delphi process for which “over the course of three months in the spring of 2014, the 2014 Horizon Project Library Expert Panel came to a consensus about the topics that would appear here in the NMC Horizon Report: 2014 Library Edition” will be a challenge and we shouldn’t attempt to read too much into the findings. However the purpose of this approach, rather than taking the safer route of simply summarizing the report, is to make the point that one should not simply accept the findings of a report on technological developments which experts feel will have an impact on the sector. Instead I feel that institutions should use the report to inform institutional planning which should be complemented by identification of developments which are of particular relevance in the context of the host institution’s local context, including local political, economic, social and technological factors. Since soliciting user responses in a large conference auditorium may prove challenging I would like to invite contributions to this post, in advance of this talk. Electronic publishing: Electronic publishing is creating a sea change in how people consume media, research, news and stories. Digital assets such as video, images, and audio can be easily deployed in a variety of media formats — a notion that has huge implications for expanding the reach of a library’s content and the dissemination of academic research. Libraries are poised to be major players in the digital revolution as academic electronic publishing becomes more sophisticated. While the PDF format (now an open ISO standard) has long been supported in libraries, closed systems, such as Apple’s iBook and Amazon e-books, are posing challenges to their existing publishing workflows. EPUB 3, a new standard for interactive and media-enhanced e-books, offers many opportunities for electronic publishing and new library content services,207 but there are still no user-friendly tools available for library professionals to aid the process. The emergence of open access policies from government agencies, coupled with unsustainable costs of print and citation cycles, has led to a shift in how education institutions publish. There is now motivation for libraries to take resources that are generated locally, including university research outputs, learning objects, and material digitized by faculty, and turn them into teaching materials as new publications. Among the chief considerations for libraries establishing such e-publishing workflows are storage capacity, comprehensive concepts for linking the scientific working process of text and scientific data, software tools that integrate and visualize complex data, copyright issues, bibliometric tools, and content hosting coordination. approach, mobile apps are small, simple, and elegant. They generally do one thing, or a small list of tightly related things, extraordinarily well. They cost so little, trial versions are unnecessary, and it is simple to outfit a tablet or mobile phone with exactly the feature set one wants for far less than one would pay for typical desktop software. The evolving nature of the scholarly record: With the advent of mobile apps, the way we think about software itself is changing, and whole industries are adjusting to a new world in which sophisticated but simple tools routinely sell for 99 cents or are completely free. In contrast with the model for desktop applications that stack feature upon feature in a one-size-fits-all approach, mobile apps are small, simple, and elegant. They generally do one thing, or a small list of tightly related things, extraordinarily well. They cost so little, trial versions are unnecessary, and it is simple to outfit a tablet or mobile phone with exactly the feature set one wants for far less than one would pay for typical desktop software. The increasing accessibility of research content: Academic and research libraries are gradually embracing the movement toward openness as the Internet has opened the floodgates of information and scientific knowledge. The open access movement has been an influential element of this trend, and it has a significant following in the library community among those who believe in removing financial and intellectual barriers for scholarly work. Major funding entities such as the UK’s Research Excellence Framework, the National Science Foundation and National Institutes of Health have implemented guidelines requiring researchers to include dissemination plans for their data along with their outputs, expanding access to encompass all scientific outputs. A number of libraries are opening up their institutional repositories, allowing the general public to access their research. Several journal publishers are meeting institutions halfway by developing novel payment schemes that are based on region or quantity of outputs. More collaboration is taking place between institutions as they work co-operatively to lower costs within the publication process. captured and archived, but also how it is accessed and retrieved by other researchers and the general public. knowledge. However according to a faculty survey conducted by Ithaka S+R, the information gateway function of the library is declining. Wikipedia, contains nearly five million content articles and over 33 million pages and although sceptics caution that Wikipedia is not a credible resource for academic research and writing projects the sheer number of registered users (21.5 million) indicates a shift in where people are going for information, for convenience and ease of use. Online environments such as Google Scholar and the Web of Knowledge curate data from multiple sources. Academic and research libraries are in the difficult position of having to compete with these channels. However rather than regarding such trends as a concerns for libraries, some library organisations are using the changing environment as an opportunity to adapt and even partner with these platforms. I’d welcome your thoughts on technological trends which will be important for libraries in the short term; trends driving technology adoption in the medium term and the difficult challenges which impede technology adoption. Or course if you’d like to make other comments, ask questions or would like to suggest, and perhaps even provide answers, for the wicked challenges facing libraries, feel free to make them! Note that the slides to be used at the talk are available on Slideshare and embedded below. Why Don’t We Share More Multimedia Support Materials? I came across two interesting posts in my Facebook stream earlier today. 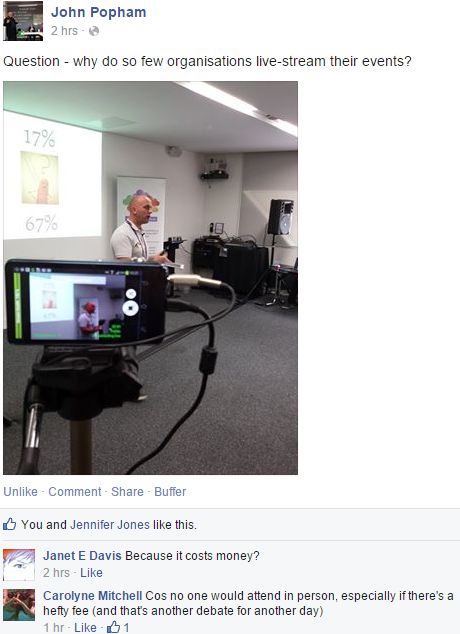 In the first post John Popham, a digital storyteller posed the question“why do so few organisations live-stream their events?” As illustrated, John provided an accompanying image which illustrated how live-streaming can nowadays be carried out using a smartphone which many of us will now carry. Live streaming of the slides using the broadcast feature introduced in Microsoft Powerpoint 2010. 11:27 lescarr: Quality of video & audio very good. It does halt sometimes. It was interesting to note how Ann had picked up on the return on investment benefits which can be gained from such informal approaches to sharing talks with a wider audience, beyond those who are physically present. Such recordings of talks will enable local staff who weren’t able to be present to be able to view talks which have been recorded using simple mobile technologies. In addition, there are typically no additional costs for sharing such recordings with others. A great ROI, especially for those who wish to promote open educational practices. And as academic librarians are likely to be involved in promoting the benefits of use of open access research publications it would seem to be a natural extension to promote the benefits of other aspects of openness. I mentioned that I came across two interesting updates in my Facebook stream this morning. 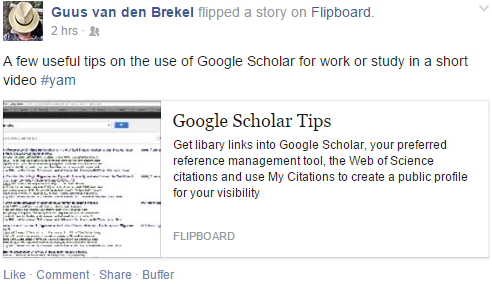 In the second update Guus van den Brekel provided “A few useful tips on the use of Google Scholar for work or study in a short video” with a link to an accompanying video recording hosted on YouTube. The video was a screencast lasting 3 minutes 44 seconds which showed Guus demonstrating some of the benefits of Google Scholar. Although I make use of Google Scholar I admit that I learnt something from this, so I am grateful for Guus sharing this not only with staff and students at his host institution, the University Medical Center Groningen, but for making it freely available to everyone and, specifically, sharing it with his Facebook friends. In addition to viewing the video on YouTube, it is also embedded below. The costs of providing live streaming, video recordings and screencasts. Concerns over being seen to make mistakes, which may be accepted in real-life presentations. A belief that institutions should be making money from their intellectual activities. A feeling that there are others who could make better multimedia resources. A concern that multimedia resources which are created may not be used. What other barriers may there be? Feel free to add a comment to this post or participate in the poll given at the bottom of this post. Is ILI providing opportunities for sharing multimedia resources? 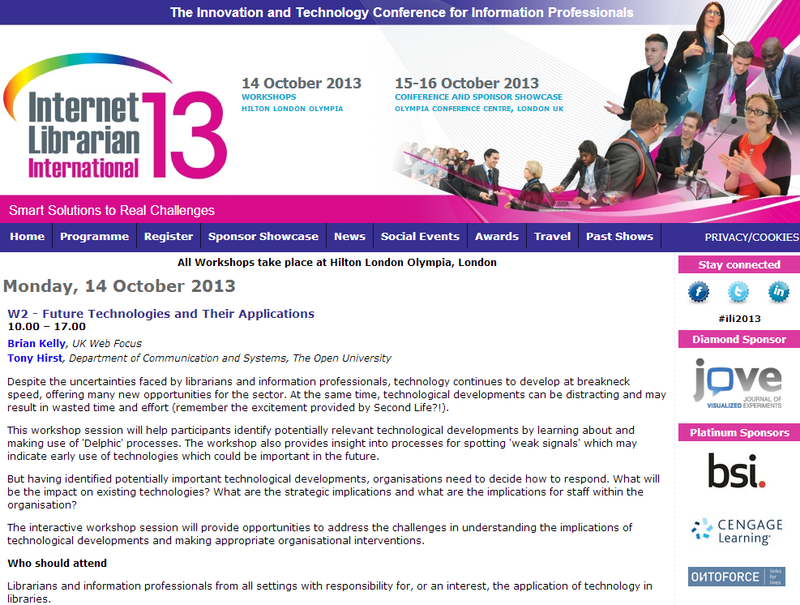 Just send or bring along some information you think would be relevant to any of the ILI 2014 conference tracks. This may take the form of something you have written, an image or two, or perhaps a short video or audio file which relates to your work. Email it to us or visit us at the ‘ILI app’ tabletop in the Sponsor Showcase. If you give us a title and a brief description of what you did and the impact it had (100-150 words max), plus whatever visual or audio content you want to share – we will add it into the app. Once we have uploaded it, your contribution and that of all your peers, will be shared in real time to the app. Perhaps this may provide an opportunity to create a multimedia resource. 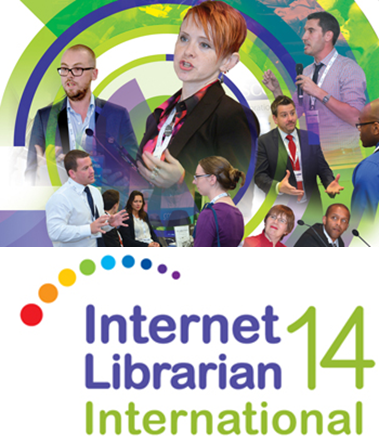 And, if you’re not attending ILI 2014, why not share it with your peers, as an open resource for other librarians? Some time ago I was asked if I would be a ‘blog partner’ for the ILI (Internet Librarian International) conference. I was happy to do that last year and again this year for ILI 2014. In a report on last year’s event I described ILI as my favourite library conference. I am attending the event again this year – and it seems the conference organisers are not resting on their laurels but are implementing a number of new features for the event this year, as highlighted in the screenshot. and problem-solving in a buzzing, fun and hands-on environment“. As illustrated the page goes on to add that “ X Track promises a new and different experience, comprising discussion, get-togethers and hands-on trials, alongside access to experts to help you resolve issues within your own professional environment“. The X Track sessions include the ILI Unconference, five’sharing sessions‘ (short, informal presentations with a chance to chat to the presenters), the ‘ILI conference App‘ (which is described as a ‘co-created conference experience’), the ‘ILI selfie booth‘ (take selfies with fellow delegates and post on social media) and the ‘Borrow an Expert sessions‘ (in which participants can spend 15 minutes with an expert through a ‘borrowing’ scheme which provides opportunity for a one-to-one meeting with a library and information specialist). Ask Phil Bradley about social media tools and search techniques. Meet Sindy Grewal, an expert career coach and knowledge management expert. Talk to conference co-chair Marydee Ojala about search. Ask Jan Holmquist about community engagement, gamification, communities and collaboration. Learn how Donna Saxby nurtured the career of style icon and reading champion @realbatgirl. Find out from Brian Kelly how librarians can engage with Wikipedia, including how to update – and even create – articles. 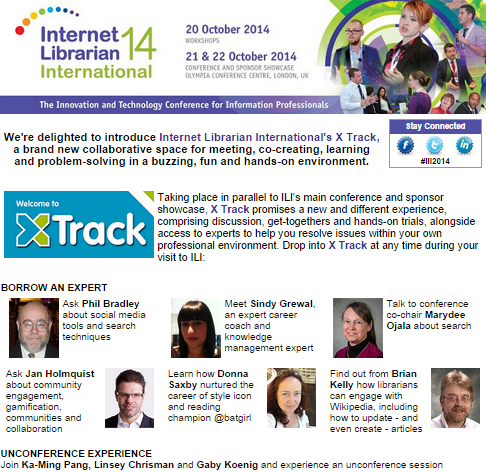 These X Track sessions take place across the two days of the ILI conference, which runs on 21-22 October 2014. In addition to the X Track there are a wide range of more conventional sessions on Tuesday 21 October and Wednesday 22 October. I hope to see some of you there. And if you are attending, do you fancy taking a selfie with me – there’s a prize for the best photo uploaded to social media! Do We Want Radical Law-Breaking Librarians? On Friday the BBC News published a story which described how “UK’s top prosecutor defends journalists who break law in public interest“. The story was about the role of journalists in making information publicly available. 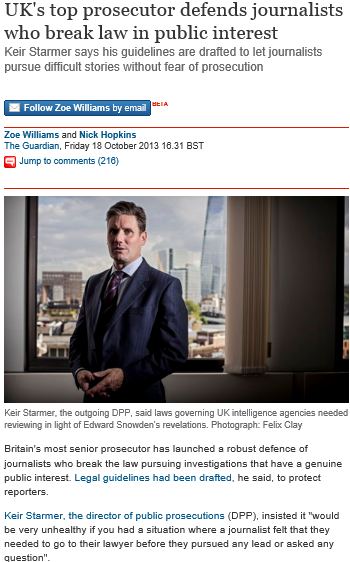 Keir Starmer, the director of public prosecutions insisted that it “would be very unhealthy if you had a situation where a journalist felt that they needed to go to their lawyer before they pursued any lead or asked any question“. As today marks the start of Open Access Week 2013 it is appropriate to ask this question of those working in librarians. Should we encourage radical law-breaking librarians who are willing to break the law or challenges established practices in making information available? Professional ethics: copyright is broken, so why am I enforcing it? Copyright law is broken. By criminalising citizens and creators in order to protect the profits of corporations, it harms the people that it should be empowering. Therefore I see it as an ethical imperative to break and/or subvert it; civil disobedience is a necessary part of a functioning democracy. It is part of my job in a library to uphold and enforce copyright law. Professional ethics are in conflict here: on the one hand, I have a duty to my employer and society to act in accordance with the law; on the other hand, when that law is wrong, it is unethical to force people to comply with it. How can this be resolved? I’m not sure that the professional ethics espoused by our current professional organisation, CILIP, are enough to negotiate dilemmas like this. What does this mean? Do we need a new, more agile ethical approach that can deal with contemporary information ethics? And if so, can we find this within existing professional frameworks or do we need a new professional body? Although I don’t know if the proposal was discussed I felt it would be worth revisiting this topic, in part due to a wish to raise the profile of activities which are taking place during Open Access Week but also as a follow-up to related discussions which took place last week at the ILI 2013 conference. As I mentioned in a summary of a workshop on Future Technologies and Their Applications Workshop Tony Hirst’s story based on his observation that the rules and regulations for the University of Cambridge Library states that “Overcoats, raincoats, and other kinds of outdoor clothing, umbrellas, bags, cases, cameras, photocopying devices, and similar personal belongings shall normally be deposited in the locker-room adjacent to the entrance hall during each visit to the Library” (my emphasis) generated some debate. Since most mobile phones these days will have cameras and can be used for scanning/photocopying they would appear to be banned from being brought into the library. This may no longer be the case (Tony’s post was published back in December 2009). But the general issue is still valid: “should libraries ban devices which have the capability of copyright infringement from being brought into the library?” I think libraries would be foolish if they tried to ban mobile phones from being brought into libraries; a more reasonable response to problems which mobile phones could cause in libraries would be to require that they are set to silent mode. But to pose the question in a different way: “should libraries provide training and support for their users to help them maximise the potential of smartphones?” Such training might include use of library-specific applications (QR codes perhaps). But what of use of mobile applications which make use of a smart phone’s camera and OCR capabilities which could be used for copyright infringement? Are any libraries running courses or providing advice and support in areas which may have the potential for copyright infringement? And in what other areas may we wish to encourage librarians, as journalists may be encouraged to do in some circumstances, to break the law in the public interest or for the benefit of society in general? Tomorrow I’m giving a talk on “Enhancing Access to Researchers’ Papers: How Librarians and Use of Social Media Can Help” at a meeting of subject librarians at the University of Bath. The talk is based on work which I’ve recently described on this blog including the post on How Researchers Can Use Inbound Linking Strategies to Enhance Access to Their Papers. The talk will also address ideas described in a follow-up post on Profiling Staff and Researcher Use of Cloud Services Across Russell Group Universities in which I suggested that, in addition, to encouraging researchers to make their researcher publications available on their institutional repository, they should also be providing metadata and links to the papers from popular third party services, such as LinkedIn, Academia.edu, Microsoft Academic Search and Google Scholar Citations, which are provided particularly for use by researchers and academic staff. The talk will highlight work in progress in making use of SEO analysis talks, including Linkdiagnosis.com and Majesticseo.com, in order to investigate what the highest SEO-ranking sites which link to the University’ of Bath’s Opus repository are. 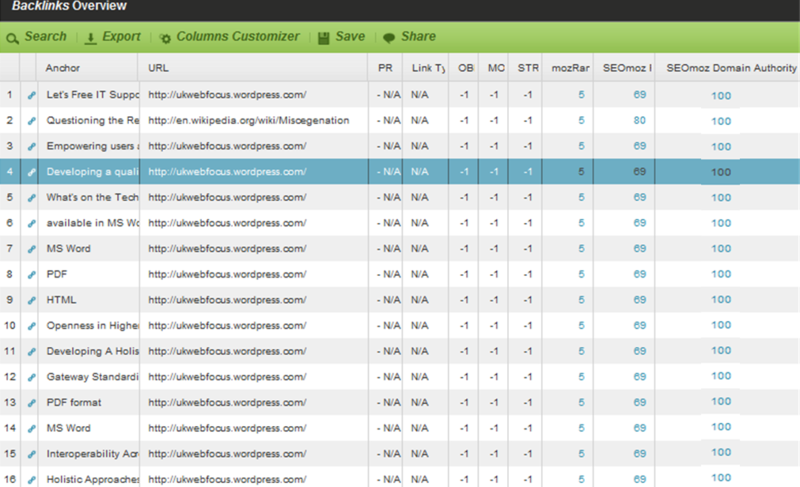 The initial findings from Linkdiagnosis.com suggests that wikipedia.org, wordpress.com, academic.research.microsoft.com and msn.com are the web sites with the highest SEO rankings which have links to the Opus repository. These four web sites all have an SEO Domain Authority score of 100, where this score “is a 100 point predicative score of the domain’s ranking potential in the search engines“. We are now in a time best characterised as the “New Normal”. The new normal isn’t just about austere budgets or the old chestnut of “doing more with less” – it’s also about new technologies. The new normal is having library patrons, users, customers and clients who know as much or more about technology than we do. It’s about partnerships and transparency, about new ways to develop and disseminate knowledge, about the increasing importance of communication skills, about opening up access to information, data, and knowledge. What is meant by the term the ‘New Normal’ and how does it apply to in a library context? I found an article on “The Politics Of The ‘New Normal’” which was published in The Atlantic in July 2009. This states that “About a third of Americans, 32 percent, say they are spending less now and expect to make their present habits a “new normal” of their future budgetings“. The writer, Chris Good, goes on to add “One can’t help but wonder if the “new normal” has political ramifications“. In a library (and educational) context in addition to the obvious economic and political changes there are also technological developments which are adding to the radical changes we are seeing across the sector. But what might the implications of the ‘New Normal’ be in a Library context? Let us assume that an accompanying discussion about such implications is based on an agreement that there are significant changes which will have an impact on working practices and will challenge orthodox thinking and working practices. I should add that although the political and economic changes are undoubtedly contentious there will be other changes which many will welcome. Many users now have the skills and access to technologies to find and access resources which previously were mediated by librarians. We are seeing a decrease in the importance of finding via metadata and an increase in the importance of social discovery. We are seeing a decrease in the importance of libraries providing access to trusted resources. Instead users now wish to access resources they find in the wild – but will need to be able to evaluate such resources. We are seeing a decrease in an unquestioning belief in the value of libraries and librarians and a need for the sector to be able to demonstrate value and pro-actively market themselves. “projects tend to be too big, leading to greater risk and complexity, and limiting the range of suppliers who can compete“: Yes, there is value in agile development and rapid innovation projects which JISC, for example, has been funding. “Departments, agencies and public bodies too rarely reuse and adapt systems which are available ‘off the shelf’ or have already been commissioned by another part of government, leading to wasteful duplication“: The not-invented here syndrome we are familiar with. “systems are too rarely interoperable“: Again we are familiar with non-interoperable silos. “create a level playing field for open source software“: The JISC OSS Watch service has provided advice in this area to the HE/FE sector. “impose compulsory open standards, starting with interoperability and security“: Many will see benefits in mandating use of open standards which can help public sector organisations from continuing to make use of proprietary formats. Whilst there are aspects of the Government ICT Strategy which make for uncomfortable reading it does seem to me that there may be benefits in embracing new approaches which may build on experiences gained over recent years in working in a changing environment with changing user expectations and requirements. I will be interested to see how speakers at the ILI 2011 conference will address the implications of the “New Normal”. Note that the deadline for submissions is 8 April – so if you have an interest in sharing your experiences I’d encourage you to submit a proposal. If you are not able to submit a proposal, I’d welcome suggestions on what the New Normal might mean to you – I’d especially welcome positive examples. I was invited to take part in a panel session at the Internet Librarian International (ILI) conference way back in 2001. Myself and my fellow panellists (Greg Notess and Mary Peterson) had encountered a number of bland panel sessions at previous conferences in which panelists uttered trite sentiments which nobody could possibly disagree with (yes, user testing is a good thing and so is accessibility and quality information). We decided to avoid falling into this trap and I found myself in the position of having to respond to Greg and Mary’s views of the key role the library sector had in supporting use of networked services and supporting users in a networked environment. I suggested that librarians were just another group of users who had nothing special to add to the development of innovative networked services and, indeed, could inhibit development by seeking to take inappropriate methodologies to the Web environment. Now although these remarks were somewhat tongue-in-cheek, it would be interesting to see how they may relate to today’s networked environment, 8 years later. 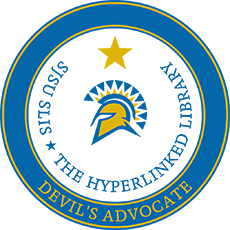 The authors of the Darien Manifesto (John Blyberg, Kathryn Greenhill and Cindi Trainor) have no doubts regarding the importance of librarians, with a manifesto which begins by giving their view that “the purpose of the Library is to preserve the integrity of civilization“. And this “purpose of the Library will never change“! Whilst a number of people have expressed concern over this monolithic description of The Library, and pointed out the unease we would feel if other bodies made similar statements (“The purpose of the government/the police/the Freemasons is to preserve the integrity of civilization and this purpose will never change“) other comments do appear to more accurately reflect the role of libraries (“provides the opportunity for personal enlightenment“; “encourages the love of learning” and “empowers people to fulfill their civic duty“) and librarians (“select, organize and facilitate creation of content” and “connect people with accurate information“), various commentators, including the Annoyed Librarian, are questioning the manifesto. Here in the UK a debate is taken place on the Libraries of the Future which is being led by the JISC. At a recent debate on Libraries of the Future Professor Peter Murray-Rust gave his thoughts on what he expects from an academic library from a research/scientific perspective. Peter’s views had been outlined in a series of blog posts prior to the debate (Peter was living his open vision and encouraged those interested in helping to shape a vision to engage with the ideas he was developing in his blog). What is happening in the world is bypassing university libraries. I talk to colleagues and the feeling is that libraries for STM (science, technical, medical) are not useful. That’s not my polemic view – that’s reporting on having spoken to people. Will librarians have a significant role to play in the academic library of the future (the future of public libraries, whilst important, was not touched on in Peter’s presentation)? And is Peter’s assertion and question in a recent blog post: “Wikipedia has won – how can we convince you?” further evidence that the librarians who warn their users against such popular Web 2.0 services are becoming marginalised? Perhaps Peter would endorse the third bullet point which calls for staff who aren’t prepared to adapt to a changing environment to be sacked. And there was me thinking that the manifesto simply endorsed woolly liberal values! Way back in December 2006 I asked Where Are The Blogging UK Librarians? There were a number of replies to the post and, since, then, I’ve touched on a number of issues related to the use of blogs within a library context. And I’m please to announce that myself and my colleague Kara Jones (who works in the Library here at the University of Bath) have had a proposal accepted to facilitate a half-day workshop (or ‘masterclass’ in the official parlance) at the ILI 2007 conference. I think the blogging UK librarians are to be found in many more places than when I first asked my question. So the issues Kara and I would like to address in our workshop include how are blogs being used; what strategies were used to get blogs deployed within the organisation (did you encounter any barriers and, if so, how did you overcome them? ); what is the technical architecture for your blog (what software do you use and is it hosted externally or installed locally); how is you blog managed; do you have any metrics to demonstrate (or perhaps justify) the success of your blog and what advice would you give to others who are just starting on this path? Note that the resources we will develop for the workshop will have a Creative Commons licence to allow their reuse by others. Thoughts, comments, etc. will be appreciated. You can add comments to this blog post. Alternatively, as part of an evaluation of the Ning social networking environment, Kara and I have set up a “Using Blog Effectively In Your Organisation” discussion area within the Library 2.0 area of Ning. Feel free to the discussions in that environment. I noticed recently that the Perth College Library Webspots blog published a a post back in April which included links to Amazon for further information about books held at the library. I think this is a useful service – the books are mentioned in context, and the Amazon link enables further information about the book to be obtained. And if the user wishes to buy the book, they can do so – and any income which the institution gains from this referral link will be useful, although this is no likely to be substantial. Is this a legitimate concern? Are libraries which include Amazon referral links likely to causing such problems? Or is this very much horses-for-courses, with different libraries making a variety of decisions, based on various local factors.